Liczba stron: 73 Jest to ujednolicona liczba stron, która ułatwi Ci porównanie długości książek. Każda strona Legimi to 200 słów. The debut novella from Nora Kipling!What if Elizabeth Bennet had turned down Mister Darcy's second proposal?What would have happened if Wickham’s devious nature had been exposed before Lydia had run off with him? Set shortly after Jane’s wedding to Mr. Bingley, Christmas at Netherfield answers these questions and more, such as what might cause dear Mr. Darcy to propose to Elizabeth a third and final time? Would she say yes? 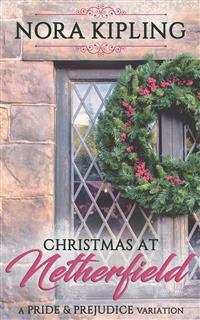 A Christmas-time ball, the Bennet family, and lots of ribbons await you in Christmas at Netherfield.This is a sweet, clean romance suitable for all lovers of Jane Austen's Pride and Prejudice. For Miss Nora Lee, for whom I was named. Thank you for the gift of your time and friendship. I treasure it, and all the wisdom you shared to this very day. Summer had melted into an unseasonably warm fall, and the harvest was longer than usual. That meant that Mister Bennet was occupied with the goings-on of the estate more than he preferred to be, and his remaining daughters in the house were left to run wild under Mrs. Bennet’s loving if blind eye to their bad behavior. Jane had married at the end of summer, a beautiful August bride with her sister Elizabeth standing up for her at the wedding, and since had been on a month-long wedding trip across the country. Elizabeth herself was sat in the drawing room, fanning herself idly as she read. Around her Mary practiced on the pianoforte and Lydia and Kitty stood at the window, giggling and breathing on the panes only to make shapes in the condensation. “Really, is there nothing else you two can do other than to giggle like mad women while engaged in the acts of children?” Elizabeth said, feeling put out and irritable from the lasting summer heat that had bled into late October, coupled with the slightly high-pitched laughter of her younger sisters. Mary glanced over at her and smiled for a brief moment before going back to her practicing. The pianoforte was tolerable, and even enjoyable as Mary was an accomplished player, but when it was combined with Kitty and Lydia . . .
“Don’t be sour just because you’re fading into an old maid right in front of us, and you’ve had no offers other than poor Mister Collins who you denied,” she said, before turning back to blow another hot breath on the glass. Kitty stifled a giggle behind her hand. Elizabeth was grateful she had not told them about Mister Darcy’s first proposal, nor about his second which she had also refused. Too much insult had passed between them for her to ever recover, she thought, and to have a fully good opinion of the man. His one redeeming quality was that he had relayed to her the truth of Mister Wickham’s nature. “You should be only so lucky that I denied Mister Collins, because who else would have been here to discover Wickham’s reputation of wickedness before you did something so foolish as to elope with him as you’d planned?” Elizabeth bit back, and Mary hit a funny note on the pianoforte and stopped playing as Kitty inhaled sharply. It was not often discussed, and even then at a hush, that Lydia had nearly ruined herself and the entire family by going on an unaccompanied sojourn with Mister Wickham. Only a last minute intervention by their aunt and uncle, relaying news of Mister Wickham’s deceits and lies as penned by Elizabeth, had stopped the younger girl from going through with her plan. The fact that he was more impoverished than he’d told Lydia had helped some too. Lydia didn’t turn this time, just ran one finger down the glass pane, her shoulders settling into a mullish posture. At that, Elizabeth knew there was no arguing with the younger girl, for one more push and Lydia would be off in a tantrum that might bring the roof down around their ears. “I think Mister Collins was delightful, but not maybe the right temperament for our Lizzie,” Mary said in her quiet voice, before shining another one of her rare smiles at her older sister. Since Jane had gone to become Mrs. Bingley, Mary and Elizabeth had become closer by virtue of now being the two eldest sisters in the household. It was doing Mary good to have her strong older sister pay more attention to her, and she was blossoming under the affection. Kitty gave a gasp, staring out the window and interrupting any further argument before it could start again. “Oh look, oh look! A messenger!” she cried and then raced out the door, all faded ribbons and whirling skirts. Lydia was close behind, giggling and shrieking, her anger at Elizabeth forgotten. Elizabeth paused for a moment and then set down her book. “It should be a letter from Jane, I would think,” she said to Mary and stood, following her two younger sisters at a more sedate pace even though she was quite excited to get word from the newly made Mrs. Bingley. Missives had not been few and far between much to Elizabeth’s delight. Although Jane was thoroughly in love with her new husband, she missed her family and Elizabeth especially. “Aside, girls,” Mrs. Bennet said as she emerged from her sitting room, brushing her loose hair back from her face where it had fallen out of it’s style in the wilting heat of the afternoon. Lydia and Kitty pushed at each other, each wanting to be the one who saw the messenger, no doubt to get a look at his tight calves and handsome horse, Elizabeth thought with a sigh. Those two should not have been out for a few years yet, but their mother refused to bring them into hand especially now that Jane had gotten married. Mrs. Bennet accepted the letter with a clipped coin as a tip for the rider, and Elizabeth sighed as Lydia and Kitty giggled and waved at the young man before Mrs. Bennet could close the door. “Oh look, it’s from our Jane, of course. Such a diligent daughter, writing to her mama every week,” Mrs. Bennet said, nearly in a comical swoon although there was no one around to impress other than her daughters. Elizabeth sighed and ambled back to the drawing room, knowing that their mother would want to read aloud from the letter first and only then might she let Elizabeth have a good look at it. She ordered up tea for the family and sank down on a velvet cushion by the fire, picking up her book again, if for nothing else but to have something in her hands. A shriek from the hallway made her look up, and caused Mary to nearly stand up from the pianoforte. Both older girls exchanged a glance, as Mrs. Bennet appeared in the doorway, her hand clutched to her chest, a wide smile on her face. Elizabeth felt her heart turn over in her chest, and she looked down at her book. Netherfield Park . . . The place that she had lost her oldest sister, her closest confidante, and best friend. She had no bitterness towards the place, as it was merely a place and to blame it for the occupants was quite unfair. She found herself tracing her fingers over the edge of her book, listening with half an ear as her mother and sisters gushed together, excepting Mary who just sat at the pianoforte with her hands in her lap. “Well,” Elizabeth said in a sudden spot of silence, “I suppose they’ll have a great ball to celebrate the holidays.” She looked up at Mary, who offered her a timid smile in return. “I suppose they shall,” Mary replied, lifting her fingers to stroke over the keys of the pianoforte. “I best practice my playing then.” Elizabeth smiled and stood, coming to join her sister, and gave her shoulder a loving squeeze. Mister Darcy looked up at the formidable building that had been the end of his shard bachelor-hood with Mister Bingley and the start of the steady ache in his heart at being denied the one woman he’d ever truly desired: Miss Elizabeth Bennet. The light of a fading October did it no favors, and he was certain he would be miserable for his entire stay.